"So when are we having Thanksgiving Dinner?" queried my mom earlier this week. Well, I was thinking of Thanksgiving Day itself, but my plans suddenly changed. Why? 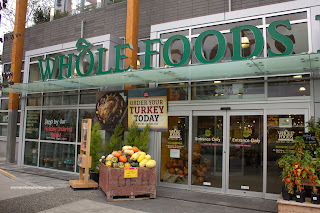 In the spirit of Thanksgiving, I received at $100.00 gift card from Whole Foods. Apparently, they wanted me to try their products, specifically items related to Thanksgiving. Well, they didn't have to ask me twice! Synonymous with high-quality natural and organic products, Whole Foods is one of the most socially responsible companies in North America. For me, I haven't had much of a chance to shop at Whole Foods since I don't live near any of their GVRD locations. In my mind, I categorize it within the same group such as Urban Fare and Meinhardt. 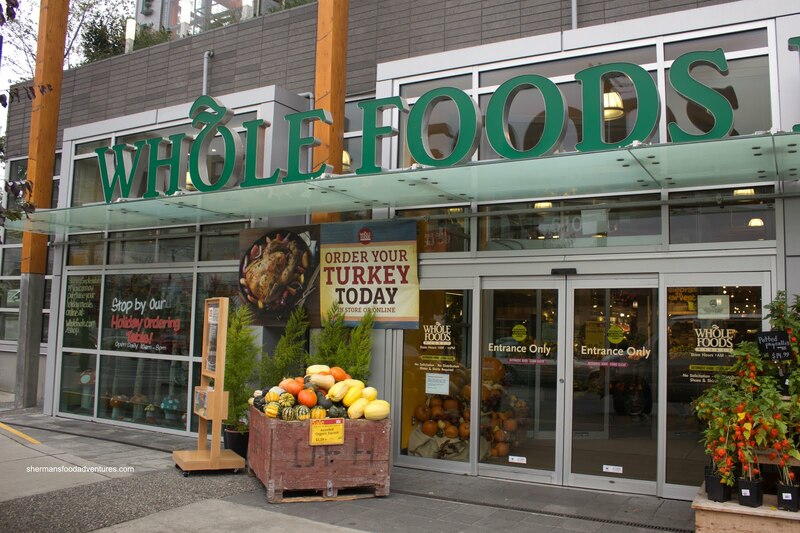 However, on a more in-depth look at the store, it is obvious that Whole Foods is larger and has more choice. However, there is no denying that Whole Foods is not exactly a cheap place to shop at. As the ol' adage says: "you pay for what you get". If your budget allows for it, the stuff at Whole Foods is all about quality. 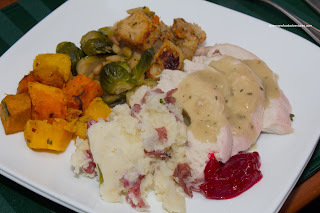 So on a weeknight, I made my attempt at doing a traditional turkey dinner with all the fixins'. Yup, it was ambitious, but I had help. For those who are a bit too busy to do everything themselves, there are pre-constructed dinners that can be ordered online for pickup within 48 hours. The 2- day advanced notice is so that they can brine the turkey. For me, I merely picked up a JD Farms fresh turkey and 4 prepared sides and some gravy. Of the 4 sides, the most interesting was the Maple-Glazed Brussel Sprouts because none of us actually like brussel sprouts. But what the hey, I've had some versions that I haven't minded and these did look good. 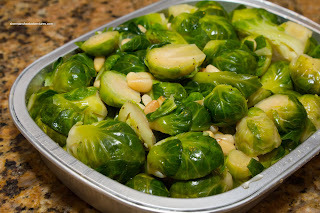 They were slow roasted with shallots and glazed with maple syrup topped with pine nuts. We liked that they undercooked the sprouts. This prevented them from going mushy when reheated. However, they were a touch too sweet for our liking. The one surprising side was the Roasted Winter Squash. Normally, it is a mild and sweet dish, but this one came with a considerable kick. In fact, it was fun watching everyone's reaction. 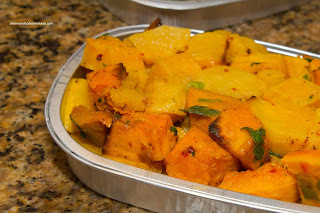 I was quite happy with the spice level because it totally livened up the nicely textured squash. Moving onto a turkey dinner necessity, we had the Mash Potatoes. Personally, I love when the skin is left on and this was the case here. 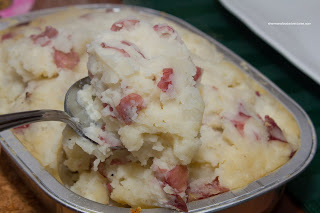 This was more of a potato ey mash rather than creamy (although there was heavy cream in it). It went well with the turkey gravy which was quite mild and tasted very natural. Of course any Thanksgiving dinner isn't complete without stuffing. 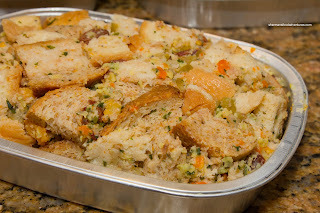 In this case, it was a Fruit and Herb Stuffing with apples, cranberries, nuts, carrots, celery and onions. With large pieces of moist bread, this was yet again another fresh and natural tasting item. I guess it helps that it didn't come out of a box eh? Loved the addition of fruit to the mix that added sweetness to the savoury elements. It was not over-seasoned nor over-moistened, so it crisped up nicely in the oven. Lastly, as I walked past the bakery section in the store, I couldn't resist and picked up a small Pumpkin Pie. Personally, I'm not a huge fan of pumpkin. I do like carving them, but eating, not so much. 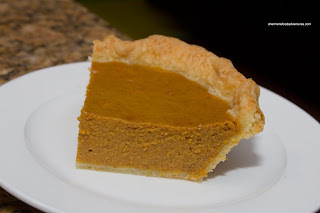 With that being said, I looked at the pie objectively and came to the conclusion that the crust was flaky and light while the filling was well-spiced and smooth in texture. A good pumpkin pie... for those who like pumpkin pie! Normally, I would make a turkey dinner from scratch and wouldn't bother picking up prepared food. Howev er, I can see the value of this option, especially for those who are busy or don't want to go through the trouble. Besides, the stuff at Whole Foods is top-notch (and I didn't need to blog about it for people to already know this) and fresh. And no, I am not saying this based on my comped turkey dinner either. I actually spent over the $100.00 by $40.00 (although I did buy a whole turkey and some cooked items to go). But one thing is clear, if you got the cash, Whole Foods has some pretty good stuff. I would love to order a pre made dinner from Whole Foods. I pre ordered a full dinner from Safeway a couple years ago since we were spending the WE down at Oktoberfest in Leavenworth Washington and thus didn't have time to make anything ahead of time. It was very cool to just pick up the entire meal from Safeway on the way home from the states and have it go straight onto the table. Safeway actually did a great job, but I'm sure Whole Foods dinner is superb. I enjoy the salad bar. They are inconsistent whether they charge for the salad dressing cups, but the ranch dressing is awesome. They had LMFAO visit last month for autographs. @Jade From personal experience now, I would say Whole Foods is better than most other stores. But then again, it comes at a price. Worth it IMO. @Rich Salad Bar and some shufflin'? Awesome!